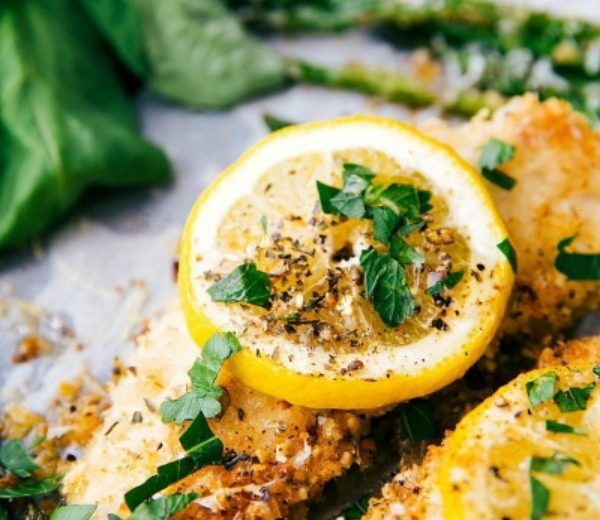 Home / One-Pan Lemon Parmesan Chicken! Happy Friday! It’s been a long week and you know I’m a sucker for a good one-pan recipe, so here it is! This week, I’m sharing a Lemon Parmesan Chicken paired with asparagus that takes just one pan! Delicious and an easy clean up – what could be better? Combine almond meal, 1/2 cup freshly grated parmesan cheese, dried parsley, garlic powder, about 1/2 teaspoon each of salt and pepper. Stir. Coat in flour, heavily dredge in garlic lemon mixture, and then coat in the Parmesan almond meal mixture. Place on prepared sheet pan. Use any remaining Parmesan almond mixture and sprinkle over tenders. If desired, place lemon slices over the chicken (optional). Do not top chicken breasts with the honey lemon mixture until you are ready to serve so that chicken does not become soggy. Enjoy!